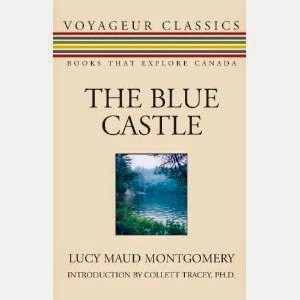 I've blogged about The Blue Castle before, and it isn't the first time I've reread it, either. I actually had to replace my old worn-out copy a few years ago. I think, without exaggeration, that this is my absolute favourite all-time book. Every time I read it, I notice something new, and it just gets better every time. I read this over the Labour Day weekend and even though I knew exactly what would happen, I couldn't put it down. I hardly even know what to say in this review because reading this book is almost a sacred experience for me. It speaks to me on so many different levels. Based on some of the online reviews I've read, a lot of women feel the same way. I have a theory it's because there's a lot of women who are hungry, starving even, for stories about women just like themselves: quiet, romantic, passionate and above all misunderstood by everyone around them. The world is a cruel place for women who possess these traits, who have reality forced on them in so many unwanted ways, their dreams mocked and belittled. The history of Western literature is about men, but The Blue Castle is our story, separate from the demands of modern life and the painful noise of male voices. Take, for instance, one of the central themes of the books: Valancy's escape from the stifling confines of family obligation. How many women are forced to be the ones to try to keep everything running smoothly in families? How many women secretly resent this? Oh yes, this is a feminist book, through and through. One early reviewer hated the book because he felt Valancy behaved in an unrealistic (unladylike) way, but what he didn't understand was that she was just ahead of her time. And yes, one could argue against the feminist theory because there is a love interest. But Barney demands absolutely nothing of Valancy except that she be herself (a trait that many women nowadays would do well to look for in a partner). There is something so wonderfully appealing about Valancy and Barney's Edenesque escape into the woods, a life of solitude that beckons even more strongly in our hectic, stressful, overworked modern lives. It was amazing to be able to sit up half the night and look at the moon if you wanted to. To be late for meals if you wanted to - she who had always been rebuked so sharply by her mother and so reproachfully by Cousin Stickles if she were one minute late. Dawdle over meals as long as you wanted to. Leave your crusts if you wanted to. Not come home at all for meals if you wanted to. Sit on a sun-warm rock and paddle your bare feet in the hot sand if you wanted to. Just sit and do nothing in the beautiful silence if you wanted to. In short, do any fool thing you wanted to whenever the notion took you. If that wasn't freedom, what was? The ability to choose your own happiness, and to live it. Bliss. Sounds interesting! Too bad L M Montgomery was only able to live out her life like this.